my copy from the author - -thanks! First -- epic-proportion sized apologies to the author & to his publicist for taking nearly a month to get this done, but sadly, I haven't had a whole lot of time because we remodeled our upstairs & I swear, it was just like moving in from scratch. But now we're all put together in time for the holidays, and it's back to reading business as usual. Finally! Word to the wise: if you're going to completely redo your home, think twice. First, let me say this: I have no idea why this book hasn't been picked up by a regular publisher -- it's certainly good enough. This author can put together a good mystery that keeps you intrigued to the last page. The novel has a good noir tone to it, along with some funny moments, quirky characters and a twisty story. 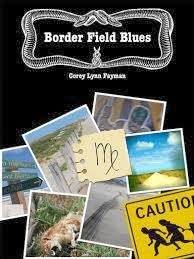 Border Field Blues is the second book in a series starting with Black's Beach Shuffle, which I thought I would read before this one but didn't get to. But I'll definitely pick up a copy now, and my understanding is that there is a third novel in the works. Rolly Waters, guitarist, former band member, and now PI living in San Diego (my favorite city in CA), has been asked by his friend Max to look into who might be behind an act of destruction that left a Least Tern preserve near the border in shambles. Rolly is just a good guy whose circumstances haven't always been so great -- not a hardboiled kind of PI at all. As a cast of strange characters starts to become interested in what he's doing, he soon realizes that he's probably in way over his head as the case leads to not one, but possibly several murders. A CD left behind at the scene is one of the few clues he has, leading him to a bizarre woman who encourages voyeurs, a young guy who drives a hearse and has a skeleton pin pierced through his septum, a crazy guy in scrubs who has a thing about scalpels and some overly gung-ho members of the AFA, a sort of vigilante group that patrols the border with paint guns. The further he goes, the more he is warned off -- but he owes it to Max to find out what happened at the bird preserve so for him, quitting is not an option. Border Field Blues starts in the past, and it is to the past that Rolly will have to turn to figure out exactly what's going on here. Aside from the few distracting typos, the only niggle I have is that sometimes the characters, although meant to be quirky, come off as a little too larger than life. The border guy, Nuge, for example, sounds like he was pulled right out of a movie. Otherwise, I really liked this one -- very unpredictable and twisty, number one; number two, the main character is very credible and realistic -- the hapless good guy who is just doing his job and gets sucked into something well beyond what he's been hired to do, and number three -- the setting is done so well -- I used to hike there, up past Monument Mesa, and the author's description of the whole area is spot on. If you forget the typos, this book is also much more polished in tone than the work of a lot of indie crime authors I've read, which made me wonder after finishing it why he hasn't been picked up by a more mainstream publisher. It's also funny at times, enough to break the tension here and there. I want to address a point made by some other reviewers about this book re the video game. Some people have said it was murky, or left unexplained -- but I don't think these people read the story closely enough to get why the author included it. It fits, and fits well considering the character involved. I didn't find any loose ends in this book. At the end of the day, the book 1) kept me reading to get to the root of what was going on, 2) had a good and twisty mystery with a satisfying conclusion, and 3) had a more polished tone than many crime novels I've read that have come from the big-name publishers. Cozy readers -- probably not for you. Hardboiled or really dark noir fans -- probably a bit on the lighter side of what you normally read. For me it had enough edginess, grit and crime to make it intriguing, mixed with odd characters that certainly kept things very lively. again...my apologies for taking forever!